Find theme and focal point. Just as each room of your home has a theme or a color scheme that anchors the look, find a unifying thread that ties your holiday elements together. Decide on a style, like modern, traditional or minimalist, as well as a color palette. Instead of traditional red and green, consider a monochromatic theme, stark blacks and whites, blush and metallics, or a warm spectrum of jewel tones. Pick your key focal points—like your mantelpiece, dining table, stair railing, or front door—and tuck in references to your theme, either its color or style, in other corners of your home. You don’t have to deck every hall in order to create a striking look. Give your everyday pieces a holiday twist. Swap out your typical white candlesticks for tapers or pillars in your holiday color scheme. 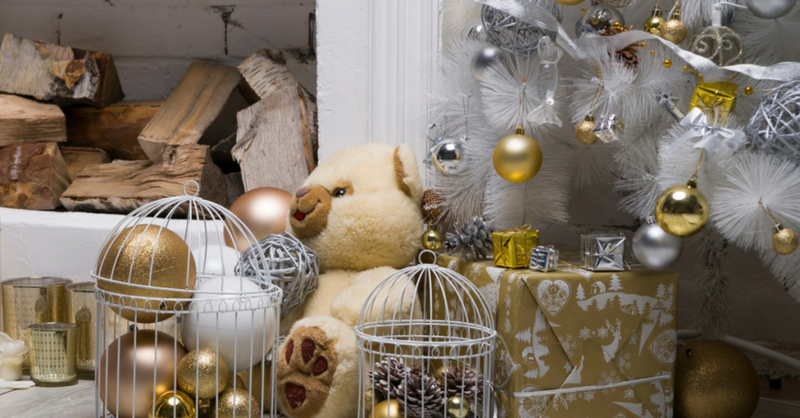 Replace the fruit in your usual cloche or serving bowl with ornaments, pinecones or fairy lights. Change the covers on your throw pillows to align with the theme, or invest in a new tablecloth. Pull out tiered servers and cake stands to add height and interest to displays of family keepsakes. For a non-traditional wreath, showcase what you love: old Christmas cards, family photos or even your children’s small trucks, dolls or building blocks. Freshen up your home by bringing the beauty of nature indoors. Live greenery brings in neutral hues and irresistibly festive fragrances. For a bigger pop of color, arrange branches and boughs with ribbon and ornaments around a statement piece like a vase or statue. Stack succulents on a tiered serving piece with ornaments interspersed, or line them up along a holiday-themed table runner. Relocate plants or forced bulbs, like paperwhites or amaryllis, into containers that reflect your theme, like a favorite holiday tin or mug, or wrap their existing pots in festive paper or ribbon. Think about what makes you happy and let that be the centerpiece of your holiday design concept. If you enjoy cooking, fill large glass jars with colored pasta, chestnuts, cinnamon sticks, and other snacks or treats you associate with the holidays. For vinophiles, a cork wreath or arrangement of festively-wrapped bottles will recall recent, meaningful toasts you’ve shared. Sheet music can be a beautiful accent for a music-lover, and a "tree" of stacked books for an avid reader is both a focal point and a conversation piece. Who you are and what you love is what makes your house a home—especially during the holidays. Showcase your personal style by choosing decorations that underline your personal aesthetic. Need some more creative ideas and inspiration? Stop by our Geneva showroom to shop our curated holiday collection.